I uploaded some pretty large images so you can see how I quilted it. I use a little machine to quilt and it was a bit tricky quilting large wind swirls when your quilt is all bunched up in 7 inches of quilted space...! But, here is the first detail photo. This is Big Ben and the blowing wind. And lastly, a pic of Mary P.
The lyrics of the song The Perfect Nanny are so sweet that I thought the title of the song would be perfect for my quilt. In case you want to see the kids sing it on you tube. And that is it for me. Now I'm off to start on another quilt - this one will be strip pieced. It's a view of Mohave Point at the Southern Rim of the Grand Canyon at sunset. (From a photo I took there a few years ago.) Should be fun! I hope you like my quilt! What a wonderful quilt! I have always loved Mary Poppins and this is just perfect! Thanks for sharing it! I wish I could stand next to you while viewing this quilt so I could ask you about all the details. But since I can't, can you at least tell me about the chimney swifts (is that what they are called?) and the birds? How are they applied to the quilt ... applique, fused, stamped? This quilt is unbelievable! So many things to see in it. You did a most wonderful job on it in every aspect. I am amazed!!! The chimney sweeps and birds are all fused on. (Fusible applique). I made little patterns and cut them out. Thanks for the really quick reply! Yes, chimney sweeps as chimney swifts are birds. Ha! I have done a bit of fusible applique so wondered (and hoped! )if that was the technique you used. I can only hope that one day I will get to see this quilt in person. It really is a great quilt for the theme you chose. Maybe you will - If it gets accepted into the National Quilt Museum's contest, it will travel around the country for a couple of years. I never quite know where it will be though. This is just beautiful! 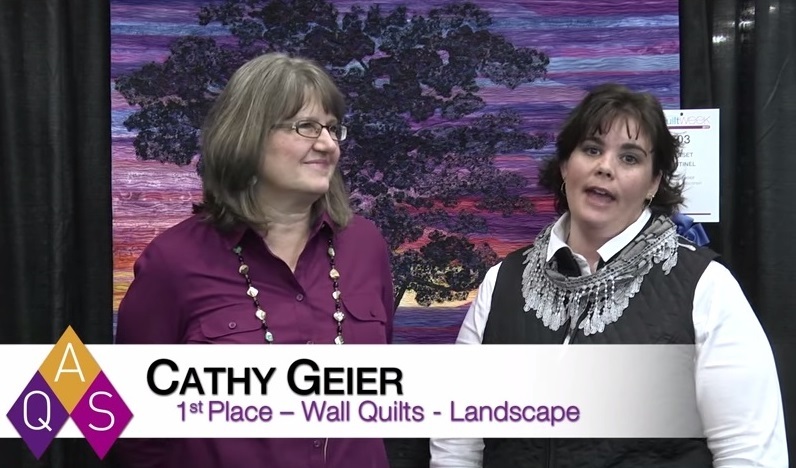 After this, you creating a landscape strip quilt will be refreshing for you! This truly is an amazing piece of fiber art. 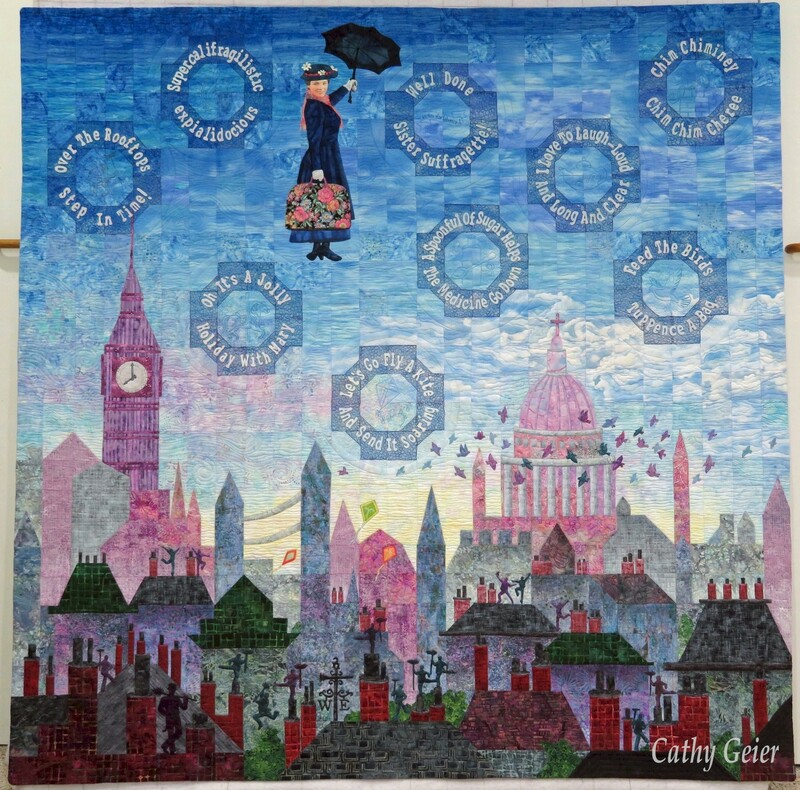 Hello Cathy, Your quilt is stunning and I know it must be heading off to another quilt show with this one. Stunning results and a incredible amount of work to finalise your quilt. To which I truly love. I wish you all the best and every success with your quilt, no matter where it is presented. Julie Beard. Thank you for sharing... that is one of the most beautiful quilts I have ever seen !!! ...... Mary Poppins was such a favorite of mine.... I still know all the songs.. ( it was the first movie I went to with a boy ! ) Quilt on !! Thanks - I'm glad you like it! My mom took me to see it when I was little - I must have been 6 years old or something like it. I'm still singing some of those songs, too. 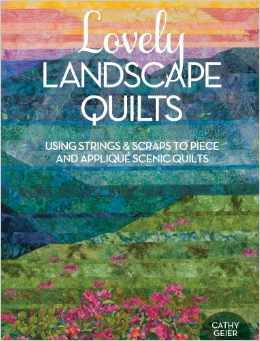 Happy Quilting Adventures to you, too! Your work is fantastic! I've tried but I can't tell... Are the words embroidered? Absolute GENIUS! This is the time of year I anticipate all the State and County Fair for all the Quilts and Pickles exhibits. We seem to live in a great goldmine of remarkable needlesmiths, and every year brings more and more exquisite and unusual works of art. You are a supremely talented quilter, with a perfect eye for pattern and the "hand" as we used to say, for the needle. This is absolutely spot-on perfect. I would imagine that you get up every morning and hug yourself to contain the joy of your great Gift. Oooo - you really liked it! Thank you!! We do live in a time of great fiber art - from painting on fabric to intricate piecing. I don't consider myself all that talented because I work so hard to do what I do, I guess when I think of a really talented person I suppose that their work just flows quickly and easily.. not like mine. Every morning I get up and I'm more tired than raring to go, lol! I do like playing with color though - a lot and I'm very thankful that I'm able to work out of my home doing stuff that is so satisfying. Thank you again for the wonderful compliments and encouragement. Such a stunning quilt! You are so very talented. Any chance this quilt will be at the Quilt Expo in Madison next month??? I always enjoy seeing your quilts in person. Pictures can only capture so much. Seeing it in person is so much better. Thanks! No it won't be - I didn't get it finished before the June 30 deadline. Alas. I just couldn't power through it fast enough... I will have Interwoven there though - it came back from the Nat'l Quilt Museum in time. Next year Gotta Dance! should be there and then in 2020? 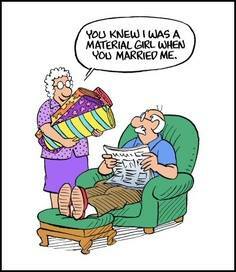 I'll have Nanny back and can show it, lol. Thanks again for the lovely compliments! 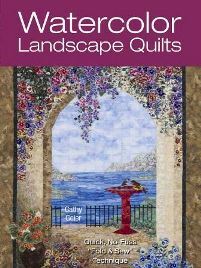 Cathy, I loved seeing your quilt here at the National Quilt Museum...I went in and looked at it often! Mary Poppins is one of my all time favorite movies. Your work was incredible!